“No Music, No Life.” In the heart of Shibuya, home of Tokyo’s youth culture, there’s a massive multi-story Tower Records shop with that sign hung in the middle of it. Much like that outdated shop standing tall in Tokyo’s hip district, Tokyo’s lowriders have resisted fading away. The record shop is where they have their monthly meeting, and it can’t be a coincidence it happens there—many of these owners got into lowriders because of the American hip-hop musicians they listened to growing up. Lowriders aren’t exactly what you’d expect to be a perfect fit for Japan. Huge, classic American cars are relative rarity here, and it’s hard at first to imagine how lowriders themselves—a product of the car cultures of mostly Latinx and black gearheads on America’s West Coast after World War II—could gain a foothold here. That’s what I thought, at least. But apparently I’ve been missing out because it seems there’s a big and strong following for lowriders in Japan. The people who’ve embraced the hilariously large (for this country) lowriders have also taken in the whole culture that goes with them. From the clothes, the accessories, and of course the meetups, the Japanese lowrider people would make their American counterparts proud. I was first introduced to the lowrider scene in Tokyo by a friend who had gone to a couple of their monthly meets and uploaded videos on YouTube. After watching about 30 seconds of a video I knew I had to go check it out for myself. They meet at Shibuya every first Saturday night of the month. Things kick off around 10 p.m. and go on until 1 a.m. or so, well past the last train. What made this particular night last year even better was it was on the last weekend of Japan’s Golden Week holiday, and it was on Cinco de Mayo. I was expecting great things. What you have to keep in mind is Shibuya is one of the busiest parts of Tokyo. It’s often compared to Times Square with the bright billboards, high-rise buildings and masses of people. Shibuya is home to the famous Shibuya Scramble, one of the busiest pedestrian crossings in Japan. So for a car meet to happen in this area is a disaster waiting to happen. At 10 p.m. on the dot—because it’s still Japan and promptness is critical—lowriders started trickling in to their usual meeting spot. Seeing the first couple of lowriders cruise around the block with Shibuya’s neon forest was as much contrast as I’d seen in all my time in Japan. These lumbering American land yachts bouncing up and down one of the most famous neighborhoods in Tokyo was something I never thought I’d see. Eventually more lowriders showed up. There were probably 20 or 30 of them at one point. As the night progressed somehow even more came. One of them, who called himself Yu-Ki from the Whodies Car Club, said the reason why there were so many of them on this night was because of it being on Golden Week national holiday weekend. Yu-Ki and his friends made Whodies Car Club to represent their take on lowriders. His favorite part of the cars are their hydraulic systems, “rare and attractive,” as he put it. Domestic cars these are not. Still, it wasn’t just lowriders showing up. There was also a matte army green Lamborghini Aventador, a lone pink Toyota HiAce, a high-riding Land Cruiser, a few muscle cars, and some USDM-style Hondas—Japanese cars done up to emulate the import tuner scene in America, a perfect example of how cultures converge and influence and bounce off one another. There was even one of those yellow school buses I’ve only seen in movies. It was a great mix of cultures that complimented all the lowriders. What brought all these guys together was wanting to express their own individual style. It’s a bit like the bosozoku counter-culture in Japan, where these people have taken ordinary cars and repurposed them into something quite different. Driving around in an old Chevrolet Impala or Cadillac Fleetwood would make you stand out in Tokyo. Installing hydraulics and candy paint just drives the point home. According to Yu-Ki, “Interest in lowriders started around 1980s but it was popular around 1990.” I got the idea lowriders in Japan peaked in the dawn of the ‘90s, which makes sense as that coincides with the end of Japan’s Bubble Economy. “Recently I feel that the number has increased by the influence of social media. But I think it is temporary.” These guys are looking at magazines from overseas, YouTube videos, and Instagram for inspiration. I also met with Hoshito-san, a fellow who attends nearly every lowrider event. He’s been running the nin_jap_apparazi account on Instagram since 2011. There, he documents Japan’s lowrider culture. By day he has a regular job. At night he comes to these meets to share his love for lowriders with the Internet. His love for lowriders came from basically the same place as Yu-Ki, from magazines and the Internet. 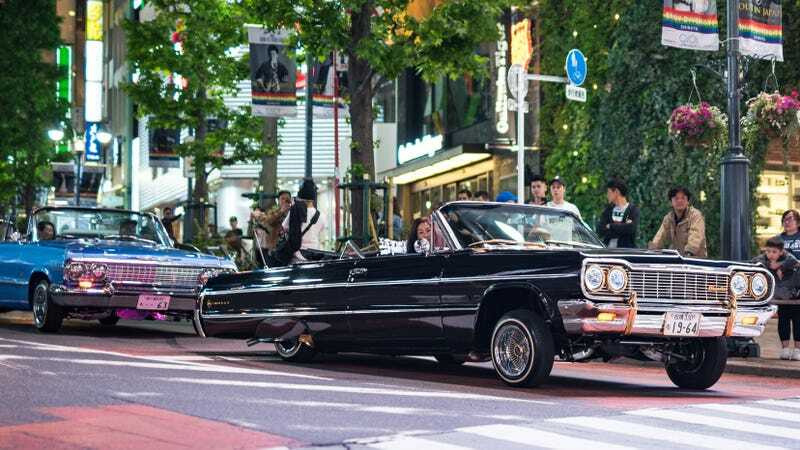 Yu-Ki’s car is a 1964 Chevrolet Impala SS Convertible. He’s spent countless hours working on it and had dreamt of owning once since he was in Junior High. “I saw Dr. Dre’s music video and I thought the lowrider in the video was so cool. So that’s why I had to buy one,” he said. Yu-Ki’s car was immaculate in that very Japanese sort of way. It certainly seemed like all the other lowriders were taken care of properly, you could almost call them concours ready. It’s weird to think one of the strongest advocates for classic cars in Japan are the lowrider drivers. Yu-Ki says that there’s still a negative stigma towards the lowrider culture in Japan, that people think they’re “involved in dodgy business” and must have a lot of cash. But it’s quite the opposite, he said. “Everyone has decent jobs and use their savings on their hobby,” he told me. These sorts of meets are just their release. They were all very nice people and welcoming to their world. Some spoke a little English and were keen to talk about their favorite American rappers with me. While I was there a couple of police cars drove by just to check the scene out. I’m not sure if the cops have caught on to their gathering every first Saturday night of the month, but it’s kind of hard to miss 50 or so lowriders in the middle of downtown Tokyo. This was the closest to an American-style car meet I’d seen in Japan. There were lowriders literally flexing around corners going on three wheels, there were Mustangs and Camaros doing burnouts on the smooth tarmac, and of course there were crowds of zombie-like photographers egging the drivers on. It reminded me of the circus I saw in Los Angeles a while back. The influence of American culture is deeply felt in Japan. It ranges from something as everyday as the infinite number of Starbucks stores to something as distant as the country’s postwar constitution. (Luckily Japan hasn’t adopted the concept of tipping.) But lowrider shops and clubs are definitely an import that’s a welcome change. Like other aspects of Japanese car culture, lowriders are doing everything they can to survive. The aim of these clubs in various regions of Japan has been to spread their passion and hobby with others, especially young people. Arguably, the oldest and most famous of the lowrider car clubs is the Homies Car Club. They started out as a small club in Saitama Prefecture in the early 1990s and since then have grown with members throughout Japan and overseas. These people aren’t just fans of lowriders, but the whole California lifestyle and are bringing some of that over to Japan. A couple of their cars attend things like the Daikoku New Year’s meet. According to Yu-Ki, young people in Japan are becoming less interested in cars, not just lowriders. Increasing economic problems for young people combined with affordable and efficient public transportation, narrow roads, and the cost of parking means car ownership in the city is less appealing. Holding regular gatherings like this, meets and events are all done in the hope of showing young people the fun and interesting side of cars. They don’t all have to be tools to get you from A to B. For Tokyo’s lowrider crews it’s more about getting together and trying to show off their pride and joy with everyone. That’s why Shibuya was chosen, because of its density and foot traffic. Several wandering and unassuming tourists didn’t know what they walked into but still watched in awe and of course had to get the video and photo to upload on social media. Every third Saturday various lowrider clubs and groups have meetings throughout Japan, not just in Tokyo. I’ll definitely have to venture out to one of these meets one day to see what they’re all about. In the end, these very American-inspired lowriders capture one of the great things about the Japanese car scene: It’s inclusive of a lot of various subcultures. There’s a lot of blending what was done in the past with the current trends of today. This ethos applies to everything from humble domestic cars to the most exotic imported supercars. Nothing is off limits here.